Ensuring you have a good balance of clients (keeping your pipeline of work topped up) is one facet of this, but the most critical part is to ensure that you invoice clients regularly and ensure they pay on time. One of the biggest challenges contractors and consultant businesses face is managing their cash flow. Without effective cash flow management, your company can fail. Many large corporations talk about smoothing the cycle and this can be applied to different areas of the business, but it ultimately boils down to smoothing out cash flow. If you have a steady stream of income coming into the business this goes a long way to ensuring that you avoid peaks and troughs in the balance sheet and available cash within the business. By ensuring that all your business expenses have optimal frequency (monthly instalments rather than yearly premiums) means you have predictable monthly outgoings. Team this with timely invoicing and you go a long way to ensuring that you have clear and predictable cash flow all year round. Where expenses cannot be made as monthly instalments, it is prudent to set aside money within the business to cover the payments for the following 3-6 months. You can read more about how to plan your cash cushions here in our business planning article. The aim for a small business is to smooth out the peaks and troughs – regular payments in and regular expenses out. Effective invoicing is all about ensuring that you receive cash into the business in good time to ensure that you can meet your expected outgoings. Look at your bank statements or balance sheet, when do the majority of your outgoings fall? This gives you the deadline to work to; when you need the payments from your clients to be received by. This can be difficult as the majority of clients work to either a 30 day payment schedule or possibly only process payments at the end of the month and funds may not even clear until the first few days of the following month. This presents a problem for small businesses as late payments can push you into the red or cause the business to fail all together. So how can you smooth the cycle? Invoice as regularly as you can – the more frequently you invoice, the more regularly cash flows into your business and you can address late payment problems before they escalate. Keep detailed records – ensure that your timesheets are up to date, all the expenses are fully supported with narrative. This is covered in more detail in our guide to day to day record keeping. Give the client all the detail they need – issue meaningful invoices that have all the detail the client needs to sign the payment off. Ensure that any purchase order codes are visible, narrative supports the items listed and your timesheets are attached to support the invoice amount. Make it easy to pay – discuss with the client/agency how they process invoices. Do they prefer hard copies or an emailed PDF? Who should the invoice be sent to? Do they issue cheques or transfer money electronically? Ensure that you meet their standard processing requirements and you’re more likely to get paid on time. Keep a track of payments and deal with late payments as they arise – when checking payments have been made, ensure that you flag late payments to the client in a timely way; don’t wait until quarter end to discuss the issue. Ensure that any payment issues are resolved and monitored as a part of your usual bookkeeping. What to invoice is dependent on the terms of your contract; usually the time spent working within a defined period plus allowable expenses such as travel and subsistence. All of the items that you bill for need to have an audit trail to enable you to justify the charges. Many clients and agencies will ask for a signed timesheet as a minimum, others may require additional purchase orders and receipts for any other billable expenses. When you produce an invoice for the client, providing explanatory narrative not only helps the client understand the invoice amount, it can also provide helpful information should you need to refer to the invoice later as part of and IR35 queries or other retrospective enquiries. To comply with legal requirements, limited companies and VAT registered companies need to include specific information on their invoices. All of the details need to be present on the invoice to ensure that you comply with HMRC and legal requirements plus enable your clients to pay in a timely manner. 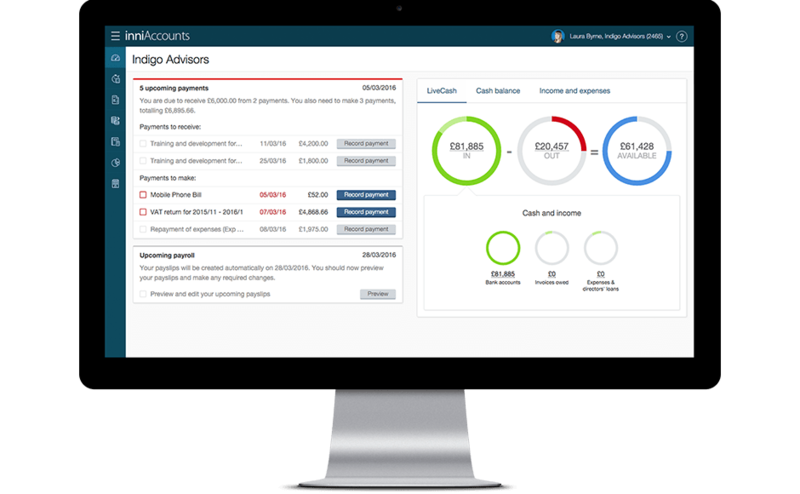 With inniAccounts, every invoice is fully compliant, tailored to each contract/client and pre-formatted so you can generate invoices within a couple of clicks. Company VAT registration number and status. Sequential invoice number (an HMRC requirement). Date of invoice (the date the invoice was raised). Description of the services/products provided and net cost. The amount of VAT charged (if you are VAT registered). Payment terms – date payment is required and payment method. Contact details for accounts/invoice queries. Keep payment terms simple; you need to tell your client when they need to pay by and how. Include your bank details, plus if there should be a reference for the payment such as the invoice number. Simple terms, in a prominent place make it easy for the client to pay on time. By ensuring that you invoice effectively and frequently, you can keep your company cash flow healthy. Providing you have a robust system in place for your record keeping and issue of invoices, invoicing should take just a few minutes each week to both issue and chase non-payment. Get the detail right. Stringent record keeping (see our previous article here) will enable you to pull all the relevant expenses and supporting information into the invoice. Accounts departments are there to ensure each and every item is accounted for and will refuse payment if there are errors on the invoice. Tailor your billing to the client. Check that: the invoice is sent to the correct individual/department; additional information such as purchase order or authorisation codes are present; the payment terms are as agreed; and that the invoice is sent in the preferred manner (the majority of large firms accept emailed PDFs). Invoice frequently and be mindful of timing. Frequency helps smooth the cash flow into the business, timely billing can ensure that funds hit your account at the right time and meet with the client’s preferred payment runs. Be firm but fair. Ensure that you include a clause about how late payments are dealt with in your contractual terms as well as on each invoice. Track payments and identify late payments early; utilise your relationships within the business to ascertain the reason for late payment and resolve them before invoking penalties. Penalties are there as a last resort, when the late payment becomes habitual without good reason. Invoicing is a necessary part of any business and it is important to remember that as a contractor or consultant you are just one of potentially hundreds of companies issuing your client with invoices. By ensuring that you provide invoices in a timely way, that they are accurate and follow the client’s preferred route will minimise the potential for non-payment issues. With sufficient cash flow within the business, you can start to take money back out of the business and we’ll cover how you get paid in the next instalment of this series. For an alert when the next instalment is available follow us on Twitter @inniaccounts or LinkedIn.